This Boston monument is located in one of the most beautiful and historic parks within Boston. The historic docks constructed and used for the Mercan- tile trade between Boston, Europe and the Caribbean during the 1600’s,1700’s and 1800’s border this park. The Christopher Columbus Park was constructed in 1974, thanks to the efforts of a non-profit group formed by residents and businesses in the North End and Waterfront areas. This tribute to the park’s namesake explorer was added a few years later. In their proximity to the North End, the statue and park emphasize Colum- bus’s Italian heritage. The statue created by Andrew J. Mazzola of Norwood Monumental Works is carved from Italian Carrara mar- ble, favored by sculptors for its quality and its translucence. The marble’s porous surface has also been susceptible to vandals, some of whom view Columbus as an oppressor, not a hero. -- Courtesy of Boston Art Commission. There Here! Boston Bronze and Stone Books. 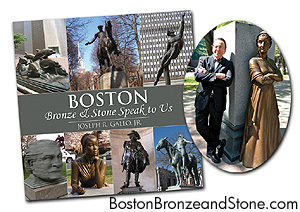 Thousands of "Boston Bronze and Stone Speak To Us" books are in. Please place your orders today! A definitive guidebook to Boston Monuments Statues and Plaques.Copies can be purchased at Old North Church Gift Shop! !